An amendment to Article 306 of the country’s penal code will now see the death penalty applied to “every Muslim, man or woman, who ridicules or insults Allah”, his messenger, his teachings, or any of his prophets, “even if [the accused] repents”, according to state news agency AMI. … Mauritania has not carried out a death sentence since 1987. Another situation that just happened that needs immediate prayers. 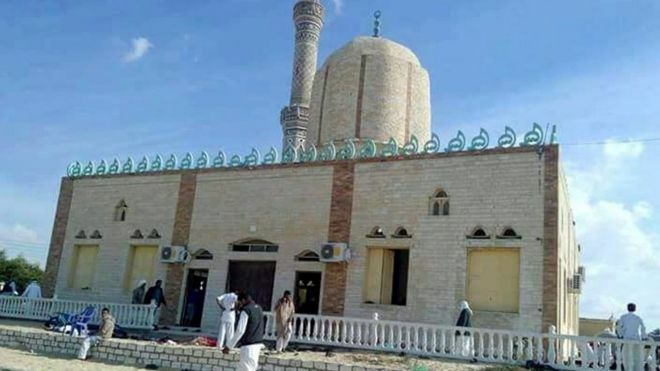 Suspected militants have launched a bomb and gun attack on a mosque in Egypt’s North Sinai province, killing at least 184 people, state media say. God have mercy on Egypt. Abba Father move the Bride of Egypt to deeply thurst for the true life. Move the nation of Egypt to thurst for Jesus. Amen and amen! Oh Lord, we rejoice with all the new Tunisian children, adopted into your family this year. We celebrate that they are no longer slaves but heirs of your Kingdom and can now call you ‘Abba, Father’! If you will listen to the voice of the Lord your God, and obey it, and do what is right then you will not suffer … for I am the Lord who heals you. Lord Jesus we thank you for Your promises of healing. We pray that the people of Algeria will listen to your voice, obey your commands so you can bring spiritual and possibly even physical healing they desire. God, be gracious to Mauritania and bless that nation, and cause Your face to shine upon them—that Your way may be known in every town and village there, Your salvation among all the people groups of that nation. Let Mauritanians from all backgrounds and social classes praise You, O God; let man, women and children praise You. Let Mauritania be glad and sing for joy; for You will judge that nation with uprightness, and guide everyone within its borders and beyond. Let Mauritanians praise you, O God; let the Moors and Fulani and Tuaregs and Wolof praise you. The earth has yieleded its produce; God our God, blesses Mauritania. God, bless Mauritania, that all the ends of the earth may fear You. May this passage become the story of many Moroccans: from darkness, to an encounter with the Lord and his rescue, ending in thanksgiving! Pray for many to cry out to the Lord for the first time. Let there be a wave of “rescue stories” this month, resulting in an exponential increase of praise and thanksgiving to Jesus. and despised the plans of the Most High. So he subjected them to bitter labor; they stumbled, and there was no one to help. He brought them out of darkness, the utter darkness, and broke away their chains. Let them give thanks to the Lord for his unfailing love and his wonderful deeds for mankind, for he breaks down gates of bronze and cuts through bars of iron. We declare, Lord that you are the Lord of lords and the King of kings. We invite to all Libyans to turn to the only God who made heaven and earth. There is none like You. You are the Alpha and Omega, the Beginning and the End.